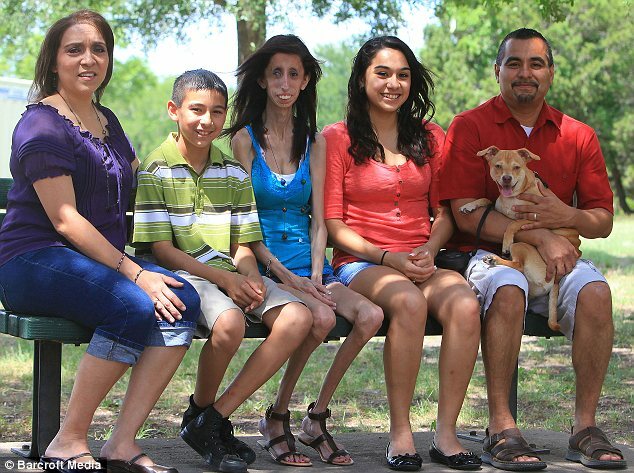 Lizzie Velasquez is just getting used to the endless stares. “The World’s Ugliest Woman,” as she was dubbed in school, is 23 years old and reportedly weighs only 58 pounds while standing 5 feet 2 inches tall. She has been ridiculed, stared at in the street and called ‘the world’s ugliest woman’ by insensitive cyber bullies. But, after years of misery and self doubt, Lizzie Velasquez says she can finally shrug off the hurtful comments about her looks as ‘just words’. Miss Velasquez, from Austin, Texas, was born without adipose tissue – meaning she has no body fat and, despite eating up to 60 small meals a day, remains at a delicate 4.4stone (58lbs). The rare condition still baffles doctors and is thought to affect just three other people worldwide. Miss Velazquez has now written a second book about her struggle to be accepted and hopes it will help others in a similar position. In Be Beautiful, Be You the 23-year-old college senior shares advice on being unique, how to make and keep good friends and how to deal with bullying and negativity. Speaking to Dr Drew Pinsky on Tuesday night about her experiences, Miss Velasquez said when cyber bullies first started attacking her online it was hard. Eventually Miss Velasquez realised the people issuing the hurtful comments online were just cowards hiding behind a computer screen. Miss Velasquez also revealed she does not have any desire to look like a beautiful celebrity. She said: ‘I feel I’m really glad I don’t look like the celebrities out there who are beautiful, because there are a lot of stereotypes attached to that. Miss Velasquez was born four weeks prematurely weighing just 2lb 10oz. Doctors found there was minimal amniotic fluid protecting her in the womb. ‘They told us they had no idea how she could have survived,’ Miss Velasquez’s mother Rita, 45, a church secretary, said. ‘We had to buy dolls’ clothes from the toy store because baby clothes were too big.’ Doctors could not make a diagnosis so they prepared Miss Velasquez’s parents for the worst. ‘They told us she would never be able to walk, talk or have a normal life,’ said her mother, who has other children with Miss Velasquez’s father Lupe – both children are of average height and weight. Despite the grim prognosis Miss Velasquez’s brain, bones and internal organs developed normally but she was always very small. At the age of two she was still only 15lbs – the same as the average five-month-old baby. Born with two brown eyes, when Miss Velasquez was four the right began to cloud and change hue. Doctors then discovered she had gone blind in that eye. Miss Velasquez’s case has fascinated doctors all over the world and she is part of a genetic study run by Professor Abhimanyu Garg at the University of Texas Southwestern Medical Center in Dallas. Professor Garg and his team now believe Miss Velasquez may have a form of Neonatal Progeroid Syndrome (NPS), which causes accelerated ageing, fat loss from the face and body, and tissue degeneration. People with PRS often have triangular and prematurely aged faces with a pointy nose. He said: ‘I am aware of a small number of people that have similar conditions to Lizzie but each case is slightly different. ‘We cannot predict what will happen to Lizzie in the future, as the medical community are yet to document older people with NPS. Miss Velasquez doesn’t take medication but she relies on vitamin supplements and iron to stay healthy. It is thought she should be able to conceive naturally without passing the condition to her children. Her new book is out on September 13. The Texas State University senior said, “I can’t gain weight,” in an interview with ABC News. Velasquez was explaining how she has a rare syndrome that blocks her body from storing fat. Even though Velasquez tries to eat as much as possible, she’s just skin and bones. The cause of her condition is unknown, and only two other people in the world are known to have it, ABC News reported. “Once I got to about age 13, I kind of got tired of it,” said Velasquez. Velasquez was heavily bullied in school, and revealed that her elementary-school years were the worse. But she didn’t let the bullying get her down. Instead Velasquez wrote two books: “Be Beautiful, Be You” and “Lizzie Beautiful.” Now the young woman delivers motivational speeches to young students across Texas. She even created a YouTube video titled “It Gets Better,” which has had nearly 2.5 million views since she posted it in 2010. She then explains that some websites even suggest that she should kill herself because of the way that she looks, but Velasquez is willing to take the bullying from strangers if she is able to stop bullying overall.